Atlanta Mayor Kasim Reed met with a packed crowd of about 150 residents Friday in Buckhead about transfering the Bobby Jones Golf Course to the state. The Atlanta City Council is set to consider a proposal Monday that would allow the Bobby Jones Golf Course in Buckhead to become state property. In exchange, the city would get property from the state near Underground Atlanta that officials said is needed to help the mall’s redevelopment. On Friday, about 150 residents in Buckhead packed into an elementary school auditorium to hear from Atlanta Mayor Kasim Reed explain his decision about the plan. Some residents carried signs opposing the proposal about the golf course, which includes turning it from an 18-hole to a nine-hole course. Reed said the state would be able to bring an investment of at least $25 million for the golf course. “In our opinion what the community is going to get at the end of the day is a significantly enhanced facility that the city, candidly, would never be able to pay for,” Reed said. 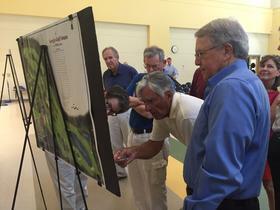 The plan would include creating a “Georgia Golf House,” which would include a Georgia Golf Hall of Fame museum, said Chuck Palmer, chairman of the Bobby Jones Golf Course Foundation. The Georgia State University golf team would also use the facility, officials said. But some residents said the proposal was moving too fast and believed it lacked transparency. Mayor Reed said the city has been talking with the state since last year about the state’s interest in acquiring the Bobby Jones Golf Course. “This is not a back-door attempt to bring in new development or commercial development into the Buckhead community,” Reed said. Proponents of the state transfer said they wanted to see the public golf course in the Buckhead neighborhood more accessible to youth. “I’m a strong supporter of the plan for the opportunities that it will create with the new facility for young folks across the metro Atlanta area to have a first-class, public facility to be introduced to and learn the game of golf,” said Kris Mikkelsen, president of Atlanta Junior Golf and resident of the neighborhood. State officials didn’t attend the meeting, though officials said they were invited. Adrean said the proposal could come up for a vote at the City Council meeting Monday.